Space Runaway Ideon is the show Yoshiyuki Tomino went on to complete immediately after Mobile Suit Gundam. It features a cast of refugees fleeing from the merciless Buff Clan and possessing the giant robot Ideon, a machine powered by the mysterious, omniscient forced called the Ide. The show was canceled prematurely at 39 episodes, but Tomino had a chance to wrap up the story with two movies: A Contact, a recap of most of the TV show, and Be Invoked, the true apocalyptic conclusion. Ideon has inspired dark, realistic anime ever since, most famously Evangelion. For the original TV show itself, I’d have to say it’s a very mixed bag. It was a struggle to complete the whole thing. The show has several good ideas and some very dramatic moments, especially towards the end. The music is beautiful and always utilized to the best effect. However, aside from the introductory episodes you could throw away the complete first half of the show and not lose anything. After about midway the show really picks up to become something great. A few of the characters often act erratic. This is very much a LOLTomino anime, and it takes a lot of patience to put up with his bizarre direction sometimes. The animation is a product of 1980, never exactly bad, or at least not often, but never exactly that great either. The final movie, Be Inoked, is much better than the show. In fact, I’d say it’s one of the best anime movies ever made; a sublime work of art that shows Tomino and his themes at their finest. It’s almost two hours of constant fighting, grim death striking down the most innocent of characters every minute, the most famous moment being when a young girl is beheaded by rocket fire. As the death toll mounts the characters continue to fight, hoping that their sacrifice won’t be in vain. The movie ends in the most beautiful ten minutes I’ve ever seen, a sublime cosmic odyssey that offers a message of hope and redemption after all the bloodshed. The movie also got a good budget, so the animation is some of the best possible for that time. The music impresses even more, an excellent orchestral soundtrack that embodies the movies uplifting themes. My main reason for first watching Ideon was its supposed influence on Evangelion. After seeing all of it I can definitely say Anno got a few things from here. Midway through the series Ideon goes berserk and lets out a fiendish yell, very similar to Eva 01’s berserk mode. A music track from Be Invoked is the exact same as one used in End of Evangelion, specifically the scene where EVa-02 rises from the ocean. The Buff Clan’s violent takeover of the Solo Ship is the exact same as SEELE’s raid on NERV. Everybody flying around naked at the end of Be Invoked invokes images of naked Shinji and Rei during Instrumentality. And then there’s the general themes of both shows: the barriers between people, growing up, and humans trying to control a force beyond their understanding. Ideon takes a step further though, addressing themes of racism, xenophobia, and militarism. In this show the characters are maybe a bit too human, showing the same fears of the unknown as we would. Biologically, humans and the Buff Clan are the same, but the fears and hatreds of them both ultimately lead them to destruction. To me, Tomino’s anti-war theme shines through best here, and it’s impossible not to see Tomino reflect post-war Japan through this series. The Buff Clan even have samurai’s that choose to die nobly in battle! It’s also interesting to compare the finale’s of Evangelion and Ideon. In the End of Eva Shinji, and ultimately Anno, rejects the merging of human souls, instead insisting that humanity should work to connect to each other the best way they can, that the struggle is more important than the ideal that instrumentality represented. Anno’s presentation of this idea is a complete rejection of Tomino’s conclusion with Ideon. At the end of Be Invoked humanity and the Buff Clan are wiped out. 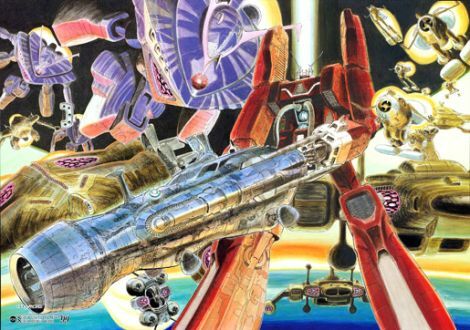 It is not the end of the universe as many fans proclaim; that must be a false rumor started to show the Ideon’s power. Instead they all become one with the cosmic Ide and are led by the purest being in existence, Messiah - not Jesus but the child of the human Bes and alien Karala. Aptly named though. The final shots show everyone transforming into light and flying into space, ultimately landing in the ocean on another world. The film ends showing real waves crashing against the shore. Ideon shows the true end of humanity in it passing on to a higher form and starting a better existence elsewhere in the universe. It’s an idea similar to the newtypes in gundam, that man must evolve to a higher form if he has any hope of overcoming war.